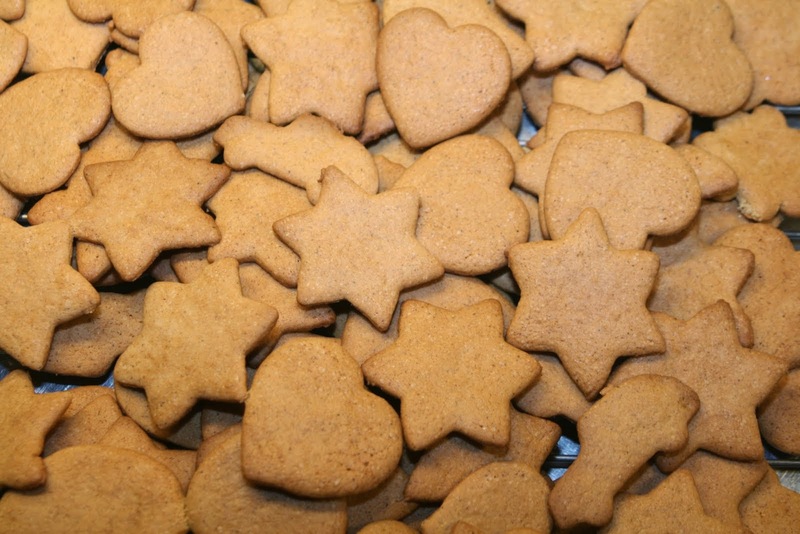 It's not Christmas until I've made my gingerbread cookies, and since our Swedish gingerbread cookies are quite different from anything I've found here in Canada, I thought I'd share a recipe. These are great to make with kids because they can choose their shapes, and help decorate them too. The recipe makes about 300 cookies (depending on size) which is a lot (although not really in our house) so you can cut it in half or quarter it if you want to just try it out to start. It's really best to use a chilled dough, so make the dough a day or two before you'd like to bake them. Mix together butter, sugar and syrup in your stand mixer, or using a hand mixer (you can also mix the dough by hand, but you will get a bit of a workout. Add spices and baking soda and mix until blended. Start adding flour, a little at a time, until a nice dough forms. You don't want to add too much, but you don't want a sticky dough either so just add a bit, mix it in and check. Wrap the dough in plastic wrap and refrigerate at least a day. When ready to bake, preheat your oven to 400-425F. Cut a smaller piece of the dough and knead it, adding flour as needed, until the dough is nice and soft. Sprinkle a little flour on your surface and use a rolling pin to roll the dough nice and thin (with Swedish ginger bread cookies, thinner is better). Cut shapes with cookie cutters and use a thin spatula to lift the cookies to a cookie sheet lined with wax paper. If you don't have wax paper, you can just grease your cookie sheet. Roll out the scraps again and keep cutting cookies until you run out of dough. Then just take another piece from your chilled dough and repeat! Bake in the middle of the oven for 6-8 minutes (time will greatly vary with the temperature of your oven, the thickness and size of your cookies so check often!) Cookies should be nice and brown, but not too dark. Remove cookies from the cookies sheet and let cool on a cooling rack. Decorate with your favorite icing, and small candies, or enjoy them plain, with a glass of cold milk (dunking them is totally allowed! We make these every Christmas! My grandma is Swedish. I am the designated family member in charge of these. I’ve never decorated them though. Do they in Sweden? I have never thought to decorate them.